I made this salad for our Easter dinner. It's quite good and loaded with healthy ingredients. I got the recipe from my sisters' mama-in-law. It's so simple to throw together. You can easily adjust the size of the salad because it has equal parts of all the main ingredients. It's made with shredded raw potato that is fried till golden brown and crunchy. It's incredibly fast and easy to make if you use a food processor with a grater attachment. Heat some olive oil until a piece of raw potato sizzles in it. Grate the potatoes and add about 1/4 cup bunches at a time. Fry them until golden brown and crunchy. When potatoes finished frying, place them on paper towel and let them cool before adding them in the mixing bowl. Mince 1 clove of garlic and mix it with 1/2 cup of mayo for the dressing. 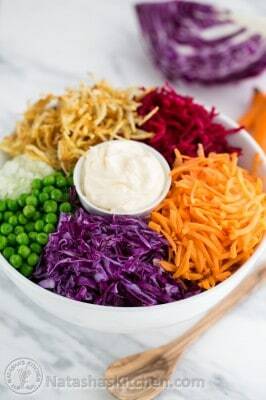 Place all of the ingredients separately in a large salad bowl until ready to serve. Before serving, mix all of the ingredients together (add more mayo, salt and pepper to taste if needed). Enjoy!